You are here: Home › Blogs › RMS › Richard Stallman's TEDx video: "Introduction to Free Software and the Liberation of Cyberspace"
Richard Stallman's TEDx video: "Introduction to Free Software and the Liberation of Cyberspace"
Are you in search of an easy way to explain to others what free software is and why it matters? Or are you perhaps wondering why you yourself should be concerned about computer-user freedom? If your answer is yes, then this TEDx talk by RMS is what you're looking for! 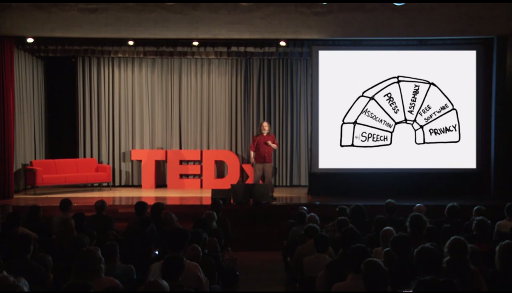 RMS was invited to give a TEDx talk at "FREEDOM (@ digital age)" in April and took the opportunity to explain the fundamentals of the free software movement to the general public. In this speech, RMS specifies the issue and makes the stakes clear; he explains what a computer is and who controls it, what the various implications of free software and of proprietary software are for you, the user, what you can do to stop being a victim, what the obstacles to computer-user freedom are, and how you can make a difference. The TEDx talks are "designed to help communities, organizations, and individuals to spark conversation and connection through local TED-like experiences." At these events, screenings of videos, like this one, "or a combination of live presenters and TED Talks videos — sparks deep conversation and connections at the local level." We hope you share the recording, to help raise awareness and inspire conversations and connections in your own circles, and introduce a friend, loved one, or acquaintance, to this "first step in the liberation of cyberspace." Download this video in a free format (HD) (SD). English slides. Similar slides in Spanish, created by Victorhck. Similar slides in Italian. Many thanks to Théo Bondolfi, François Epars, Florence Dambricourt, and the TEDxGeneva core-team for making this speech possible. Thank you to Ynternet.org and HEG-GE for hosting and supporting the event, and to Sylvain & Co., La Belle Bleue, and Jus de Fruits Suisses, ProLibre, and the Fondation Emilie Gourd, Piguet Galland & Cie., Lifelong Learning Programme, Hes.so Genève, My Big Geneva, and Smala for their support. P.S. RMS does not draw a salary from the FSF, but your donations do support the coordination of events and videos like this. We'd love to produce more introductory videos. Can you donate $25 today? This recording is licensed under the Creative Commons Attribution-No Derivative Works 3.0 license.